The RIDGID® Model RV6000 vac is the top performer in it's class. Its portable design makes transporting and stowing hassle-free, while the powerful motor gives you enough suction for most common messes. Ideal portability, power, and durability in a compact wet dry vac design. 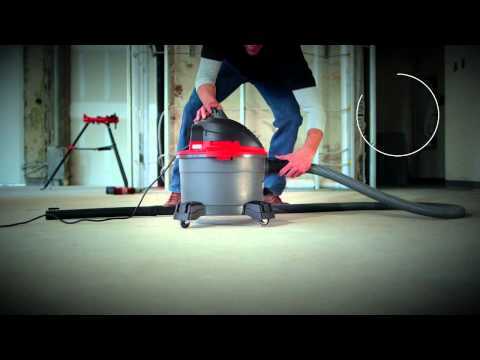 Incredible 4.25 Peak Horsepower - High performance wet dry vacuum. 360º Caster Wheels - Provides increased maneuverability. Large Handle - For ease of portability. Accessory Storage - Keeps accessories organized and close by for easy access. Power Cord - 10' Power Cord for Extended Reach. Includes - Vacuum, owner's manual, 2 extension wands, 1 7/8” x 8’ premium locking pro hose, utility nozzle and standard filter. 6 Gallon Wet/Dry Vac is rated 4.2 out of 5 by 321. Rated 5 out of 5 by Foot from The product worked very well on a large project I had. The product worked very well. My only criticisms are that when I cleaned the filter with water it took a long time to dry before could use it again. Replacement filters are expensive. Rated 5 out of 5 by Bill33177 from Very happy with purchase, hope it lives up to the expectations. The vac seems to be well built, powerful and has a great warranty. Rated 4 out of 5 by killertruck from has good suction, works well purchased to keep area around my fireplace cleaned up daily. Works well for this task. Did not come with a crevice tool and is the one attachment I needed most...had an old crevice tool that works ok. Hose is on the flimsy side and will kink easily, but works ok. Satisfied with this unit so far. Rated 2 out of 5 by Willy19977 from An easy to use product, but not very powerful The vac itself, like every Ridgid vac, was easy to assemble and set up. The power, however, left much to be desired. It had trouble picking up small paint chips from the drywall, and even the dust proved challenging. Perhaps it was the leaks in the hose clamps that prevented its potential from being fully realized. A great disappointment, as I have used Ridgid vacs in the past, and have been quite impressed with all that have come before. I have returned this vac to the location from which I purchased it. I can't seem to get the extension wand to connect to the hose. Is there a trick to this? It just doesn't seem to fit right. What is the filter mesh size? What is the smallest particles that it will filter out? Dust, pollen, mold? Vacuum comes with a single pleat paper filter VF4000 for large dirt/sawdust size. You can purchase a 3 layer filter VF5000 for dust/drywall dust or a 5 layer HEPA filter VF6000 for pet dander/mold/pollen. The VF7000 is a foam filter for use during wet vacuuming.